"Discovering Ridge's work and life will be a delight for readers of women authors, feminism, and poetry, especially those interested in activist writers." "Radical, modernist, fiery, glamorous, feminist— adjectives and categories can only gesture toward the enduringly significant life and works of the poet Lola Ridge, whose story has been gracefully told, with her poems lucidly understood, by Terese Svoboda." 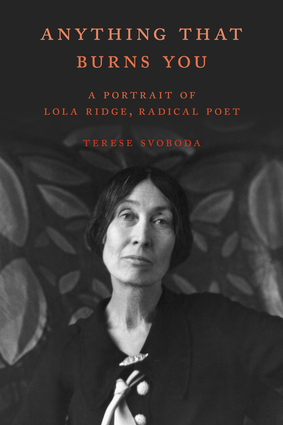 "Anything That Burns You tells the riveting story of Lola Ridge, a revolutionary and influential poet of her time . . . . Terese Svoboda has written a brilliant biography, as original as it is compelling. We need more books like this one." The first full-length biography of Lola Ridge, a trailblazer for women, poetry, and human rights far ahead of her time. A rich and detailed account of the life and world of Lola Ridge, poet, artist, editor, and activist for the cause of women's rights, workers' rights, racial equality and social reform. Author Svoboda takes the reader on a fascinating journey from Ridge's childhood as a newly arrived Irish immigrant in the grim mining towns of New Zealand to her years as a budding poet and artist in Sydney, Australia, to her migration to America and the cities of San Francisco, Chicago, and New York. At one time considered one of the most popular poets of her day, she later fell out of critical favor due to her realistic and impassioned verse that looked head on at the major social woes of society. Moreover, her work and appearances alongside the likes of Margaret Sanger, Emma Goldman, Will Durant, and other socialists and radicals put her in the line of fire not only of the police and government, but also the literary pundits who criticized her activism as being excessive and melodramatic. This lively portrait gives a veritable who's who of all the key players in the arts, literature, and radical politics of the time, in which Lola Ridge stood front and center. Terese Svoboda is an American poet, novelist, memoirist, short story writer, librettist, translator, biographer, critic, and videomaker. She is the author of five collections of poetry, five novels, a novella and stories, a memoir, and a book of translation. Her essays, reviews, fiction, and poetry have appeared in numerous publications, including the New Yorker, Paris Review, the Chicago Tribune, Ploughshares, the Atlantic, Poetry, Times Literary Supplement, Yale Review, Slate, and the New York Times. She was the recipient of a Guggenheim Fiction Fellowship and the Money for Women Barbara Deming Memorial Prize, and she currently teaches fiction at the Center for Fiction in New York City. She lives in New York City. Read a conversation with Terese Svoboda on Lola Ridge's life in Shelf Awareness. Anything That Burns You is published by Schaffner Press and distributed by IPG. Visit Schaffner Press' Facebook Page for updates.